Most visitors know that Maputo used to be known as Lourenco Marques and is the largest city in Mozambique. Did you know that it is also known as the ‘City if Acacias’ due to the amazing acacia trees lining its streets? Yes, come to Maputo and spend your holiday exploring the city’s treasure, its beaches and vibrant nightlife. You will always remember your taste of flamboyant and stylish Mozambique hospitality here and the spicy food! A highlight of your Mozambique holiday is a few nights in the Radisson Blu Hotel and Residence . Comfort is the key word so have fun in the fitness centre between meals and enjoy a cup of coffee on the deck beside the swimming pool. Tuck into mouth-watering pasta and fish at the Filini Bar and Restaurant for real Italian cuisine and fine wines. Or meet new contacts at one of 3 trendy bars. Stop for drinks and light snacks in the Palmeira Lounge any time of day. High tech conference facilities accommodate conference and board meetings in a divisible conference room, a pre-function area and a business centre. Three elegant spacious meeting rooms offer air-conditioning and the latest audio visual technology. Businessmen will elect to stay in the 32 exclusive Business Class Rooms complete with king size beds, Nespresso coffee machines, free internet access and flat screen TV. A plush hotel in the city centre, Hotel Avenida offers the highest standards to tired businessmen and families rearing to go. Work out in the high tech Health Club and Spa, do laps in the outdoor swimming pool, then sip great South African wines in the wonderful bar. Guests return again and again for the high class restaurant serving fine international foods. Not only is this remarkable establishment also a wedding venue with ballroom and honeymoon facilities, a hair salon and sauna but so too is Hotel Avenida proud of its business facilities including free high speed Wi-Fi in 8 well equipped meeting rooms – complete with audio-visual equipment and computer station. Discover this regal Mozambique Hotel only five minutes away from cultural and historical sites in Maputo: the glorious Botanical Gardens, colonial city hall, museum of natural history and Maputo Cathedral. 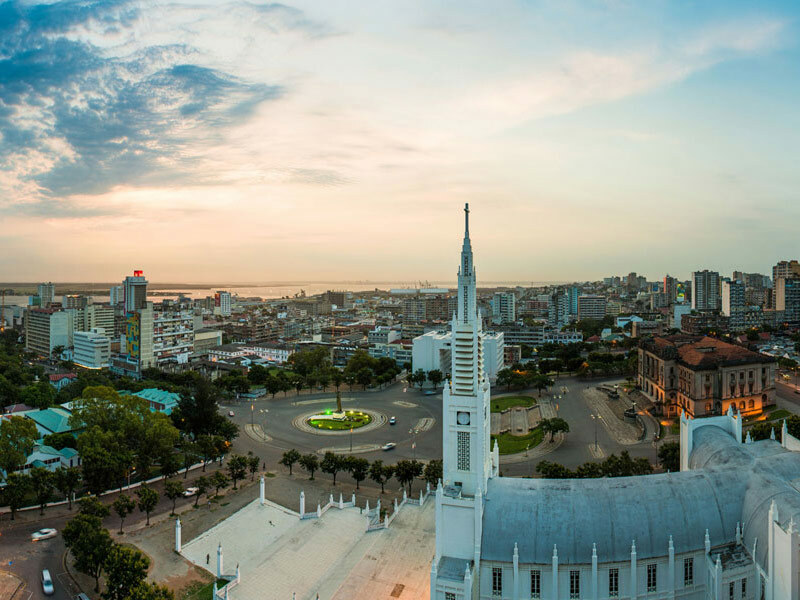 Once in the city, you will quickly discover that Maputo is a hive of activity and there is never a dull moment. Spend two days or 10 days here and book a few exciting day tours to nearby game reserves and beaches. Choose to stay in the elegant Girassol Indy Congress Hotel & Spa ,only 10 minutes from the airport in the suburb of Sommerschield. You will love the classically decorated rooms fitted with air conditioning, cable TV, safety deposit boxes and tea-and-coffee making facilities. Swish bathrooms offer hairdryers and free quality toiletries. Order your meals from room service or dine in the restaurant for greater ambience. Relax on sun loungers beside the swimming pool, play tennis or work out at the fitness centre. Massages and beauty treatments can be booked at the spa and there is also a hairdresser. With sweeping views over Maputo Bay and the city below, the renowned Hotel Cardoso is a fantastic Mozambique holiday venue to which businessmen flock to mix business with pleasure.The hotel sits on a cliff and boasts endless green gardens, a large swimming pool and inviting patios. Five meeting and conference venues cater for small sessions or larger conferences and weddings. The on-site business centre caters for printing, copying, faxing and computer needs. Guests can eat delicious food at Fiamma Restaurant and lighter meals at Cafe Acacia. Sample dishes with Mozambican, Portuguese, African and Mediterranean flavours – carefully crafted by Cardoso’s team of international chefs. Sip sundowners at Bar Pôr do Sol then head for Maputo’s bustling metropolis. The Monomotapa Restaurant on the second floor of the popular Pestana Rovuma Hotel seats up to 96 diners. Try dishes from the buffet or order special Portuguese and Mozambican meals from the a la carte menu. A Snack Bar & Cocktail lounge provides a terrace with snacks and pastries for meetings or leisurely chats. The hotel is a stone’s throw away from wonderful vibrant Mozambique street markets and nightclubs to rock away the nights. Conference facilities and a gym with steam room suit businessmen who work hard then need to unwind before dinner. Fantastic historical architecture, museums and other landmarks make a stay in Maputo’s Pestana Rovuma Hotel well worth it. Eat at the stylish Veranda restaurant or the Delagoa Restaurant at the worldly and elegant Polana Serena Hotel in Maputo, and meet others in the Aquarius or Polana Bars. Don’t miss the range of international foods combined with local Portuguese flavours. Then work out at the first rate gym, health club and spa; dip into outdoor and indoor swimming pools; walk in lush, tropical gardens; get a new hairstyle at the salon and buy gifts at the curio shop. Built in 1922 the five star Maputo hotel offers 168 elegant rooms, nine executive suites and 9 garden suites, all with en-suite gardens, air-conditioning and elegant decor. Other features include satellite TV, free internet access, mini bar, free newspaper and tea and coffee making facilities. Flights to Mozambique land at the Mavalane International Airport so drop in and enjoy the exotic carved furniture, luxurious fabrics, and the colonial-Portuguese atmosphere of this Grand Dame. Maputo is a businessman’s paradise and this hotel is equipped for conferences, banquets and more with secretarial services, a ballroom and other facilities. Contact us for our opinion and we can direct you to the right hotel for your city needs.